America has been blessed with many saints, hundreds of heroic missionaries, and hundreds of martyrs, only eight of whom (the North American Martyrs) have been canonized. This article will highlight a few prophetic voices that warned of the catastrophic assaults upon faith and morality that we are now painfully living through in our own country. I speak of scandals within the Church. The first voice to sound the alarm was our own Father Leonard Feeney (1897-1978). Father’s concern, as our readers well know, was the assault upon that foundational doctrine, “The Catholic Dogma,” as Father Michael Mueller C.SS.R. called it, extra Ecclesiam nulla salus. Since Father’s crusade for this ex cathedra dogma is well known, I will limit my focus to his dire forecast for the future of the Church in America unless there is a return to teaching the true and only way to salvation. Good morals cannot survive in a climate of doctrinal weakness. It was, for him, as simple as that. Just recently, the previous Prefect of the Holy Office, Cardinal Gerhard Mueller, noted the same in his critique of the current abuse crisis in the Church. He said, “The corruption of doctrine always brings about the corruption of morality and manifests itself in it.” Luther, Henry VIII (and Cramner), Calvin, and his fellow Swiss “reformer” Zwingli compromised morality in their contrary-to-scripture heresies and their preoccupation with denigrating the necessity of good works. Every day You defer calling a halt to the wild liberalism of the American hierarchy, a Liberalism which pays not the slightest attention to Your Messages against Interfaith movements…the more will grow the spirit of indifference and apostasy in our land, and ten years from now will be too late to save it. …Unless You are the thundering leader of the world, other thunderers will take Your place. Father also pleaded with the pope to condemn the heresy of an invisible church, the so-called “soul of the Church,” to which sincere non-Catholics could belong, telling him that he may as well “throw away his tiara” if the Church of Christ can be “invisible.” Prophetic? Indeed it was. 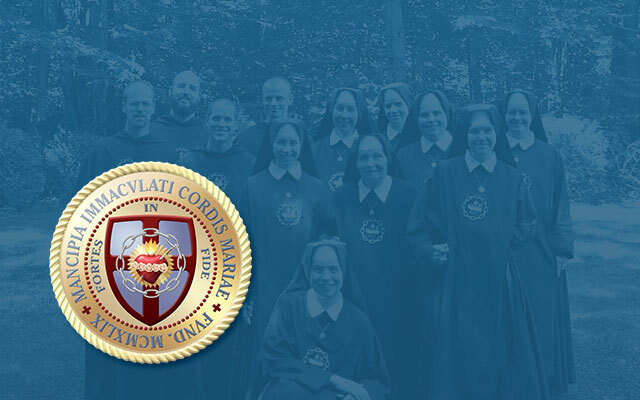 While the crusade of Saint Benedict Center was in full gear and during the years Father Feeney was preaching the Faith on Boston Common, Our Lady was visiting a nun in the convent of the Precious Blood Sisters at Rome City, Indiana. The sister’s name was Sister Mary Ephrem Neuzil. And the Blessed Mother gave her the assignment of communicating urgent messages to the hierarchy in the United States. The information that follows is from my article “Our Lady of America” on our website. Our Lady first appeared visibly to Sister Mary Ephrem on September 25, 1956 at her convent in Rome City, Indiana. She appeared as she did at Lourdes. Her message was a promise of “great miracles of the soul” for her children in the United States if they would heed her call to repentance. In particular she expressed her pleasure for the honor the Church in America had given her by dedicating the national shrine in Washington D.C. to her Immaculate Conception. Our Lady directed Sister Mary Ephrem to speak to her ordinary, Bishop Paul F. Liebold, later to be made Archbishop of Cincinnati. Long before he was ordained Bishop of Evansville, Indiana, in 1958 and, soon afterwards, Auxiliary Bishop of Cincinnati, Father Liebold, had taken an interest in the visionary, personally hearing her confessions and giving her spiritual direction. This pious and well-respected shepherd was convinced early on that Sister Mary Ephrem’s locutions were truly from heaven. In fact, from his first year as a priest, that is from 1940, until his death in 1972, Bishop Liebold was the seer’s spiritual director. Faith! Divine, Catholic, Faith. “If you love me, keep my commandments” (John 14:15), Our Lord said. And Saint Paul, “Without Faith it is impossible to please God” (Hebrews 11:6). There you have it. Faith and Love. Charity proceeds from divine faith, if our faith is alive in Christ. Was this not the message shouted “from the housetops” by Father Feeney? On September 26, 1956, Our Lady opened her Immaculate Heart to her “Little White Dove,” as her Son called Sister Mary Ephrem — the “Little Secretary of [His] Heart.” The most important of Mary’s messages to her devoted secretary were given on this day (today,in fact, as I post this on the feast day of the Eight North American Martyrs). “I am Our Lady of America, Immaculate Virgin,” she said, “I desire that my children honor me, especially by the purity of their lives.” How fitting it was that the Blessed Mother delivered the heart of her message to the seer on this day, the feast of the Eight North American Maryrs. They had been canonized twenty-six years earlier by Pope Pius XI. Our Lady promised great things for America if her requests were granted — if not, she said, as with her warnings at Fatima, there would be terrible consequences. She specifically called upon the youth of America to dedicate themselves to holy purity. They would thus be children of her Most Pure Heart. From among them she desired to form an army who would be called “Torchbearers of the Queen,” carrying her message of faith and purity to all other nations of the world. If her requests were obeyed she promised to grant peace to the United States and use our faithful to spread the peace of Christ throughout the world. By her emphasis on purity, which echoed the Fatima message, the Blessed Mother was lamenting the deluge of impurity that was drowning out the life of grace from so many of the faithful, more so in 1956 than in 1917. And, as her warnings implied, unless the bishops launched a crusade for purity, then, and after, the situation would only get worse — and worse. Be it noted that young Catholic men in the late 1950s would become the clergy of the 1970s and even bishops in the decades that followed. The alarm was not sounded for the most part by the bishops of the late 50s. Our Lady’s message went unheeded. Enter the crisis of the clergy and religious that is now public. The punishment will be long, and for many, forever. Remember Fatima: “More souls go to hell for sins of the flesh than for any other reason.” This warning, relayed by Mother Godinho, directress of the Lisbon orphanage where Saint Jacinta died, was given to the sister, along with many other similar ones on penance, by the ten-year old seer before her death in 1920. Indeed, it is impurity that keeps most of those outside the Church from coming in, and so many of those in the Church from eternal beatitude. On September 27, 1957, the Blessed Mother stressed again: “My beloved daughter, what I am about to tell you concerns in a particular way my children in America. Unless they do penance by mortification and self-denial and thus reform their lives, God will visit them with punishments hitherto unknown to them.” Six months later, she said: My Immaculate Heart will win in the end, and the Spirit of Christ will dwell in the hearts of men. Those in whom this Spirit is not found will be condemned to eternal hell-fire.” Remember, this was forty years after her similar revelation at Fatima. In one of her messages (usually given on her feast days) as Our Lady of America, Mary referred to the these times as “the darkest.” Her voice and face betrayed her grief: “Beloved daughter,” she sighed, “you wonder at the sword and the deep wound it has made in my Heart. It is the sword of grief plunged therein by my children who refuse to let me teach them the true way. There is only one way to the Father, my child, only one way to eternal union. It is the way of the divine humanity. It is through my Son, the Only-Begotten of the Father, that souls attain perfect union with the Divinity, as perfect as human nature is capable of, aided by grace.” (February 11, Feast of Our Lady of Lourdes, 1958) On Boston Common, Father Feeney, who, of course, knew nothing about Our Lady of America, was thundering this same message in terms of a defined dogma of the Church. In a little booklet I have, published by OurLadyOfAmerica.org, which carried the Imprimatur of the late Bishop Leibold (+1972), it is affirmed that Our Lady often emphasized to Sister Mary Ephrem that she desired the Basilica Shrine of the Immaculate Conception in Washington D.C. to be a special place of pilgrimage. She wished to be honored there as “Our Lady of America, the Immaculate Virgin.” It would be then most fitting that this be done with all the United States bishops solemnly installing her throne there in procession. It is never too late. Father Richard Heilman, author, and writer for several Catholic websites, made this very appeal recently, that is, for a public and collegial act of reparation by all the U.S. bishops in the national basilica. He posted this appeal on the website Roman Catholic Man. The article is titled; “It’s High Time Our Bishops Process Our Lady of America Into the Basilica in Washington DC”. Also, a statue of Our Lady of America was carried in procession in the Basilica of the National Shrine of the Immaculate Conception in Washington, D.C., on several occasions by the Apostolatus Uniti and other groups. A specific request of Our Lady of America was that her statue be placed in the Basilica of the National Shrine of the Immaculate Conception. There is a providential connection between Sister Mary Ephrem and the late Archbishop Bishop John Francis Noll of the Diocese of Fort Wayne, who is celebrated as the Apostle of the National Shrine. The principal apparitions of Our Lady of America to Sister Mary Ephrem took place in the chapel of the Precious Blood Sisters Convent in Kneipp Springs Sanatorium, near Rome City, Indiana. Archbishop Bishop Noll, who died in 1956, maintained a summer residence at the Sanatorium, within a few hundred feet of the place of the apparitions. While the National Shrine is the largest shrine in the world at which there was not a previous apparition, the private revelation to Sister Mary Ephrem very much confirms the mission of the National Shrine. Although the devotion to Our Lady of America has remained constant over the years, in recent years the devotion has spread very much and has been embraced by many with special fervor. Seemingly, as has been suggested by Father Peter Damian Mary Fehlner, F.I., in his homily of August 5, 2006, at the Shrine of the Most Blessed Sacrament in Hanceville, the moral crisis of our time, which demands a new teaching and living of the virtue of purity, has found an especially fitting response of loving care from the Mother of God in her message to Sister Mary Ephrem. A prophet is not only one who foretells future events, but also one who reveals things from God that are hidden from ordinary human knowledge. In this sense, we can say that Our Lady is a prophet. She knows the present and the future and reveals what God wants her to reveal to us. Sadly, as with her request for the collegial consecration of Russia, her words go unheeded. For Moses said: A prophet shall the Lord your God raise up unto you of your brethren, like unto me: him you shall hear according to all things whatsoever he shall speak to you. And it shall be, that every soul which will not hear that prophet, shall be destroyed from among the people (Acts 3:23). Yes, this passage refers to Christ, but it can also be applied to His mother. Now here we have an American priest who was truly prophetic. Like Father Feeney, he was not exactly a “prophet,” but he was most certainly prophetic. How ironic that he had Cushings for ancestors. Like Father Feeney, he was a Massachusetts native, born in Framingham three years before Father Leonard in 1894. He was educated by the Jesuits at Boston College. Also at BC during the same time as Fitzgerald was the future Archbishop of Boston, Richard Cushing, who was a year younger than he. In fact they both went to the same seminary in Brighton. Perhaps they were cousins. Perhaps, at least, they knew each other. Father Fitzgerald served as a parish priest in the Boston archdiocese for twelve years. At the age of thirty-nine he received permission to join the Congregation of Holy Cross. Three years later, after taking his vows, he was appointed superior of the order’s seminary. While at this post he wrote Juxta Crucem, the life of Blessed Father Basil Moreau, the order’s founder. Our “prophet” priest was already in his fifties when he embarked upon a new mission, one that would exhaust him for the remainder of his life. It came to him by “accident.” One day a beggar came to his rectory asking for an alms. After giving the poor man a sum of money, the man, after he had thanked him, turned around on the pathway and said, “I used to be a priest.” Father Fitzgerald was cut to the heart. How did this happen? he wondered. And why aren’t we priests doing more for those among us who are tempted to give up their vocations? To say that Father Fitzgerald was impulsive would be an understatement. Immediately after this experience he resolved to establish an order of his own to take care of priests with celibacy, alcohol and substance abuse problems. He named the new congregation the Servants of the Paraclete. But that was after he bought 2000 acres of land in Jemez Springs, New Mexico, where he built a retreat center for priests with addictions. The archbishop of Santa Fe, Edwin T. Byrne, had welcomed Fitzgerald. In fact, he was the only bishop who supported the venture. The year was 1947. The article I am reading about Father Fitzgerald does not say how many vocations entered the Congregation of the Paraclete, however, there must have been quite a number, because in his own lifetime twenty-three such retreat centers were opened around the world. Did I say that Gerald Fitzgerald was controversial? No? Well, he was. And it wasn’t because his therapy was unconventual. It wasn’t. It was a simple program of intense spiritual reformation through prayer and the sacraments. But it had never been employed for priests. A priest would either hide his addiction or abandon the priesthood. There were no programs of rehabilitation. And Fitzgerald was opposed to Alcoholics Anonymous for all the right reasons. Did Father Fitzgerald’s policy win out with the bishops of his day (he died in 1969)? With some, yes. In general, No. By 1969, and even more so afterwards, the vast majority of bishops accepted the false science of medical and psychological experts who counseled them to send sexually troubled priests to psychiatrists for a cure. So they said; so it was done; so we have our crisis. Three billion dollars worth of crisis. And, God knows, how many souls lost. Therein lies the real tragedy. Msgr.Stephen J. Rossetti, president and CEO of St. Luke Institute, a treatment center for abusive priests, rejects the conclusions of Father Fitzgerald, offering statistics that justify their own raison d’etre. Dominican Father Thomas Doyle, on the other hand, supports the work Father Fitzgerald championed. Justifiably cynical, he argues that the documents show the bishops were put on notice “five decades ago that this is a very serious problem” adding that the only reason they acted in 2002 “is because they were forced to take action because of public outrage — of the media and the courts. If those things had not come into play, nothing would have happened.” How true! Father Fitzgerald fought on valiantly to reform the reformable clergy and leave the other guilty deviates to immediate laicization and/or criminal courts. For two decades he wrote regularly on this issue to American bishops and to Vatican officials. I myself would be inclined to favor laicization for any priest, upon objective evidence, for tampering with the virtue of the young, my argument being, from this point onward the charity to the Mystical Body should take precedence over charity to the individual, […] Moreover, in practice, real conversions will be found to be extremely rare […] Hence, leaving them on duty or wandering from diocese to diocese is contributing to scandal or at least to the approximate danger of scandal. In his day, such bluntness was unusual, if, for some realists, refreshing. But his solution forty years ago was very controversial. Today, however, among the fed-up faithful, maybe not so controversial. It was his more extreme solution (which he did not communicate to Rome) that may have cost him some support in the 1950s and 60s before his death. What was that? A remote island in the Caribbean. Yes, that is how strongly he felt about the sexual abuse of minors. He even put a $5000 down payment on such an island (sale priced for $50,000), near Barbados. He had discussed this idea favorably with Bishop Byrne, his order’s patron. With Byrne’s death, however, his successor, Bishop James Peter Davis, disapproved, and Father Fitzgerald had to sell his interest in the island. The “prophet” from Framingham went to his reward a few years later, June 28, 1969. He is buried at the Resurrection Cemetery of the Servants of the Paraclete in Jemez Springs, New Mexico. He was a true “master,” a consummate retreat giver, the “real thing,” as many of his devotees testified. They were based on the Exercises of Saint Ignatius, but given with a flair that was in the spirit of John the Baptist. Approximately six thousand priests attended his retreats, 142 of them, over a six-year period. His first one for priests was not given until he was fifty years-old, that is, from 1931 to 1939. For eight years prior to that he gave retreats for anyone. After 1939, was taken off the retreat track completely. Why? The only reason I could find was that his superiors thought they were “too controversial.” He spent some time at Santa Barbara, California, at Loyola University in Los Angeles, and at Edmonton College, Alberta. He spent his last years at St.Regis Mission with his beloved Indian children, where in 1951, he died of a stroke. A solemn requiem Mass was sung at St. Regis and Bishop Langlois of Valleyfield officiated. His body was brought to Montreal. Thirty cars full of Indians drove after the hearse for eight miles. Father Lacouture was born in 1881. He went to the College of the Assumption near Montreal, afterwards entering the Jesuit novitiate at Sault-aux-Recollets. Interestingly, our future retreat master once resided at St. Andrew’s on the Hudson in Poughkeepsie, New York, where he studied English. Father Feeney had his novitiate at this same provincialate house some forty years later. (In this era of the “new springtime” for the Church, St. Andrew’s is now the campus for the Culinary Institute of America.) Back to Canada for three years of philosophy at the Jesuit Seminary in Montreal. Then he was sent for a time to Alaska to teach the Eskimos. These interruptions in formation are the Jesuit way combining studies with pastoral work. In 1916, upon completion of his four years of theology, he was ordained a priest. He was then thirty-five. It was on the feast day of Saint Ignatius. During World War I he volunteered as a military chaplain. His duties took him to India, France, and Belgium. One of his companions during this time was the great spiritual writer, Father Raoul Plus, S.J. When he returned he became prefect of Saint Boniface’s College in Manitoba for three years, then he went to Caughnawaga, near Montreal, where he was for four years pastor of that Indian Mission. This mission is home to the shrine of Katari Tekakwitha. Here, in Caughnawaga, at the age of forty-two, is when he began to give spiritual conferences. They were so good that his superior put him on the Mission Band, which had its headquarters at the novitiate at Sault-aux-Recollets. Father Lacouture’s retreats were four or five conferences a day, of an hour each. Afterwards there was a fifteen-minute period of meditation in the chapel before the Blessed Sacrament. Complete silence was maintained for a week. It was very strict. No communication with the outside world was allowed, except, of course, for an emergency. Only the New Testament or the psalms were allowed for reading. The purpose of the retreat was to fortify priests in the spirit of the gospel. A priest ought not to be of this world in any sense. Like Saint John the Baptist, they ought not to be “reeds shaken by the wind.” I could not verify it, but, I would venture that the retreat master wore a hair-shirt rather than “soft garments.” In his day, Jesuits did still do daily flagellation. If you put yourself in Father Lacouture’s hands you had to follow directions, as though you were in the care of a physician. Indeed this Jesuit was a physician of souls. And, not only priests were his patients. The laity also were invited and encouraged to bring along their friends; agnostic Jews, practicing Protestants, even some Quakers made his retreats. In this he was like another Jesuit mission priest, Father Arnold Damen, from Chicago who died a year before Father Lacouture was born. Damen converted 70,000 to the Catholic Faith, including General James Longstreet (Robert E. Lee’s second in command at Gettysburg) and Senator Stephen A. Douglas of Illinois. Even though Lacouture was Canadian, he was, as can be ascertained by his spiritual counseling, much opposed to Americanism. Of course Canada is part of America. He took Pope Leo XIII’s encyclical, Testem Benevolentiae, to heart. Ideally, Church and State, ought not to be separated. Catholics, as this Jesuit believed, were first citizens of Christ’s kingdom, the Mystical Body, before any allegiance to nation. He was not opposed to patriotism, a natural virtue, but to nationalism. And, in the early 1900s, nationalism was on the rise. Hence, he stressed our higher citizenship, without which, even patriotism would be of no spiritual value. It was in this sense that our Jesuit director of souls emphasized the complementary of nature and grace. The former ought to provide a foundation upon which the latter can build. Sanctifying grace comes from faith without which “it is impossible to please God” (Hebrews 11:6). Ergo, without sanctity it is impossible to please God. When Christ spoke, he spoke from the Mount to the multitudes. He called on all men to take up their cross and follow Him. When we listened to Fr. Lacouture’s retreat [taped, I assume], we began to understand the distinction between nature and the supernatural [We understood] that grace builds on nature and we saw for the first time man’s spiritual capacities raised as he is to be a child of God. We saw the basis of our dignity. As I wrote above, Father Lacouture was forbidden to give any more retreats in 1939. Why? Some disgruntled clerics accused him of being a “rigorist.” He was not. There was no trace of Jansenism in this master. All else I could find regarding his so-called “controversial” style had nothing to do with his doctrine, but with increasing misunderstandings” with his superiors and some clergymen. He accepted this cross with humility and holy joy. He was not even allowed to preach or teach. With Father Feeney his silencing was for defending a defined dogma of the Faith, for Father Lacouture, it seems to have been for being too serious about the Church Militant’s obligation to be militant, beginning with their own spiritual life. Both were identified with what their disciples called “the Doctrine.” I found it rather amusing that what irked some pastors was that our retreat master condemned gambling as a form of fund-raising in parishes! Ouch! No Bingo, no raffles! Assuredly, there was a lot more that irked the more delicate ones. This is why I include Father Onesimus Lacouture among those “prophets” who were sounding clear trumpets in the first half of the twentieth century. The most renowned disciple of Onesimus Lacouture was Father John J.Hugo. His magnificent book, The Gospel of Peace, was based on Father Lacouture’s retreat talks. Hugo was one of the 6000 priests who went on Lacouture’s retreats. The Gospel of Peace is available from our bookstore here. Fr. John Hugo (1911–1985) was a priest of the Diocese of Pittsburgh who spent much of his life giving retreats based upon those that he had participated in while still a young priest in the 1930s. Those retreats were given by Fr. Onesimus Lacouture S. J. and Fr. Hugo was one of over 6000 priests to whom the retreat was given over a course of several years. The Retreat, as it was affectionately called by its devoteés was an electrifying and life-changing experience for many of them. It was nothing more nor less than the Spiritual Exercises of Saint Ignatius. But these retreats given by Fr. Lacouture were, as the saying goes “the real deal.” They were given as St. Ignatius intended, for the proper length of time and according to the true Ignatian spirit. They got to the real “roots” of Christian living. They were, in short, radical. Fr. Hugo became a disciple of Fr. Lacouture in the sense that he experienced the fruits and saw the necessity of the retreat for Catholic Americans. He determined to continue that work as part of his priestly vocation. This book, The Gospel of Peace, is one fruit of that work, and it was very controversial at the time of its publication in 1943. The Gospel of Jesus Christ is always controversial because it is “out of step” with the world. Hugo later remarked that Day’s initial request for direction from him was “less flattering than frightening.” In his posthumously published Your Ways Are Not My Ways (1986), Hugo said that “dying and rising was the stuff of [Dorothy’s] daily living. She was a mystic in the Pauline sense, loving to the limit…. No need to hunt for miracles in Dorothy’s life,” he added. “Her whole life was a miracle.” Further, Hugo said, Dorothy did not “consider [the retreat] extreme or rigoristic or Manichaean or Jansenistic. She understood it as the language of love.” To Day, it was certainly a call to metanoia: to a radical change of heart and mind by means of taking up one’s cross and putting everything in the perspective of God’s grace. I think this observation sums up Hugo’s mission itself through the eyes of an extraordinary woman who was not known for being very circumvental. She lived as she spoke. No guile. Nor was she a respecter of persons in the sense of being intimidated by anyone. She was humble but certainly not taciturn. She once told a certain bishop (I cannot remember which) to stop riding around in a limo with a chauffeur and walk the walk, or words to that effect. One must admit that she was a spunky rascal. It is also worthy of note that even while World War II was raging Day and Hugo were both labeled “pacifists.” It is a fact that they were opposed to the war, but I doubt that Father Hugo was a pacifist in the absolute sense as was Dorothy Day. After all, neither John the Baptist nor Our Lord required military men to quit their occupation. There are just wars. There is a duty to protect one’s family from violence. This is, after all, more than common sense. It is a duty. I suspect that with Hugo the issue was the morality of modern weaponry and the inevitability of “collateral damage” to civilians. I would also assume that it was this war, World War II, that he found unjustifiable. The fruits, after all, were the enslavement of eastern Europe to atheistic communism and genocidal “purges” in several Catholic nations. Father Hugo’s famous retreats were called “Encounters of Silence.” How sad that Father John J. Hugo died tragically in a car accident in 1985. He had so much more on his to-do list. Nevertheless, his motto was “Deo Volente.” God calls when He calls. Behold, now you that say: Today or tomorrow we will go into such a city, and there we will spend a year, and will traffic, and make our gain. Whereas you know not what shall be on the morrow. For what is your life? It is a vapour which appeareth for a little while, and afterwards shall vanish away. For that you should say: If the Lord will, and if we shall live, we will do this or that (James 4:13-15). Much more could be written about Father John J. Hugo. His book, The Gospel of Peace, will give you a good idea of his uncompromising character. I have chosen these four subjects as examples of unheeded prophets.Three priests and one Sister. The events surrounding each were more or less contemporary, all occurring in the first half of the twentieth century and/or a decade or two later. Sister Mary Ephrem’s revelations from Our Lady were, of course, immediate. She was the Blessed Mother’s “Little White Dove.” Father Leonard Feeney was a clarion voice echoing the thrice-defined dogma of Faith, extra Ecclesiam nulla salus. The dogma, as one bishop said, was “a dead horse that ought to be buried.” Father Gerald Fitzgerald was a crusader for the purity of the clergy, a reformer, a pastor who warned about homosexuality in the priesthood before the crisis exploded publicly. Father Onesimus Lacouture, likewise, was a reformer, radical in the sense of getting at the root of the problem of clerical laxity — acedia. He preached a return to the spirit of the gospel of Christ the Lord. He sought to put fire back into the priesthood and the laity through his missions. He was, like Fathers Feeney and Fitzgerald, “controversial.” So much so that he found himself silenced. Let us pray to these champions of the Faith. From heaven they can and will help the Church Militant. May their voices be silent no more. Father Feeney’s voice is being heard still through his disciples. Father Fitzgerald, in fact, was cited recently when his sealed documents were unsealed in 2007 by a court order obtained by the Beverly Hills law firm of Kiesel, Boucher & Larson. Even his order, the Servants of the Paraclete, established in 1947 to treat priests with psychological and substance abuse problems, kept his letters secret. His voice has been resurrected. Perhaps we will soon see Father Lacouture’s crusade return to life.